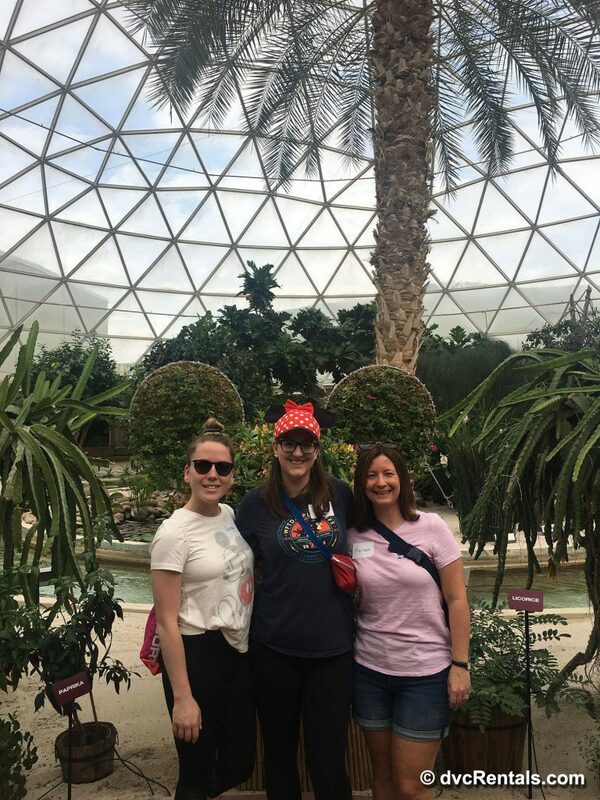 For those of you who have been to Disney more than once, have you ever had a chance to take one of many tours they offer? When planning a vacation to the most magical place on earth, there are so many adventures to go on and always something new to explore. Of course, the theme parks are an absolute must on the “to do” list, however there are so many extra’s right around the corner. 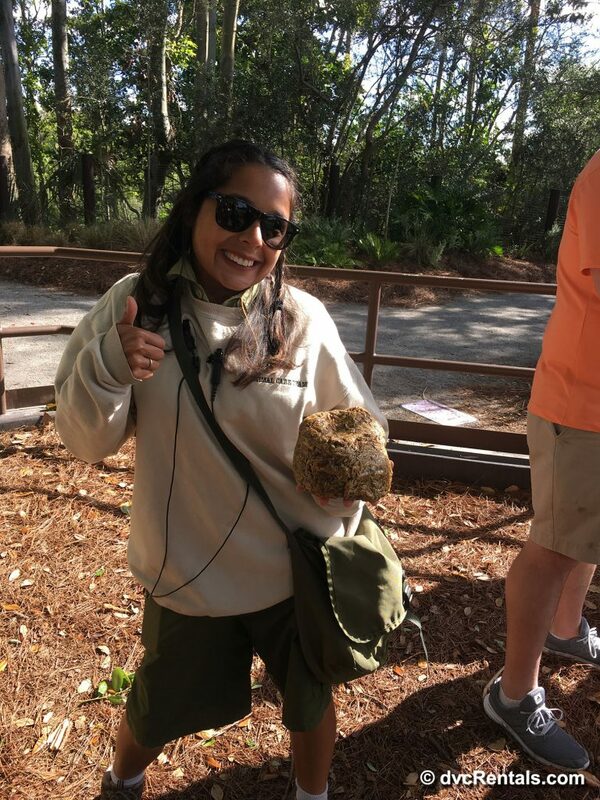 During my 5th time traveling to Disney, I had the chance to go on a couple of different tours, and I loved every minute! 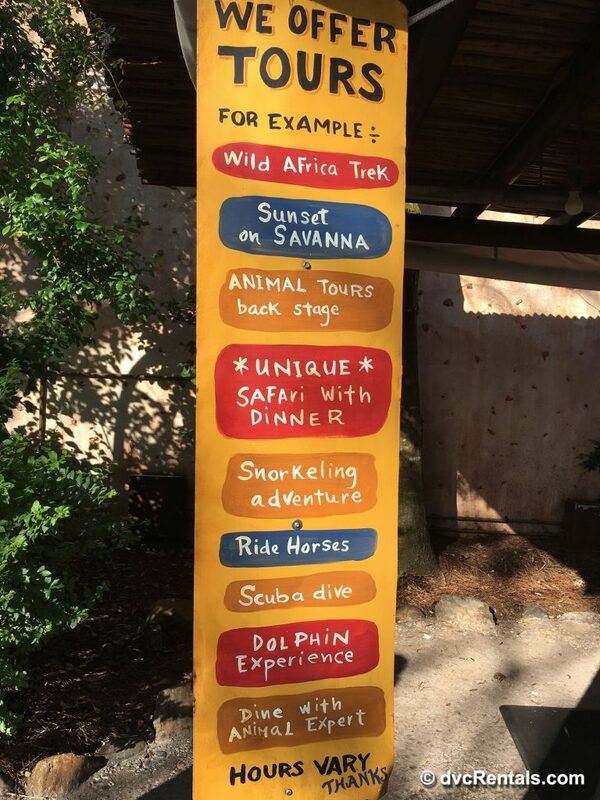 I had always known that Disney had many options for guests to keep their vacation the best that it possibly can be, but then again it had never crossed my mind to take advantage of something more out of the norm. 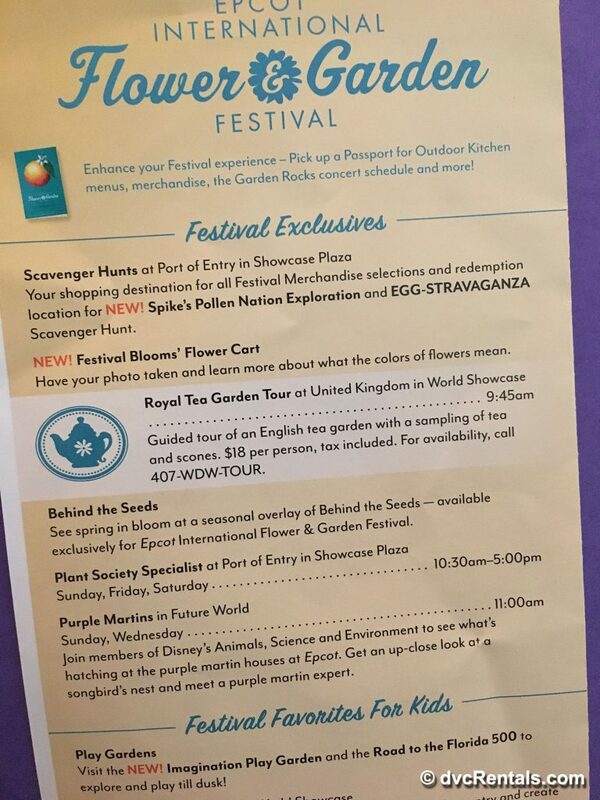 On the 2nd day of my stay, I had the chance to take the “Behind the Seeds” tour at Disney’s Epcot (The Land Pavilion). For those of you who have not had the chance to go on this tour, let me fill you in! What’s great about this one is that it is set for all ages and you learn so much background on the future of agriculture. As we made our way through learning about soils, plants, fish, etc. 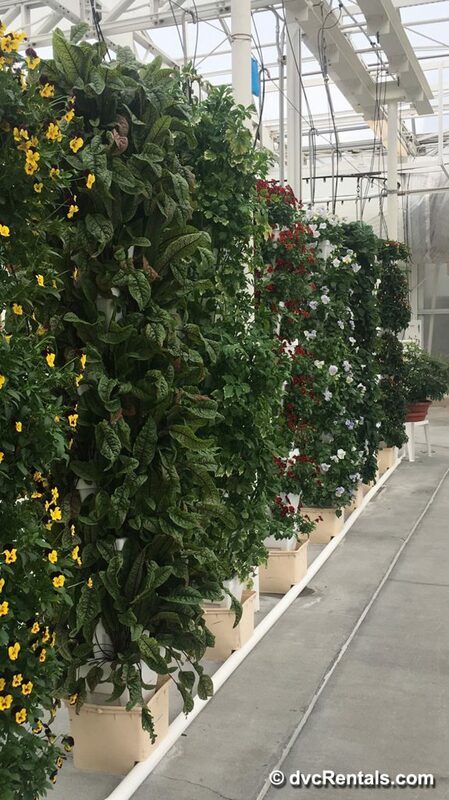 you will see below some of the plants in the first greenhouse that they keep nourished, and we had learned all about the growing techniques. 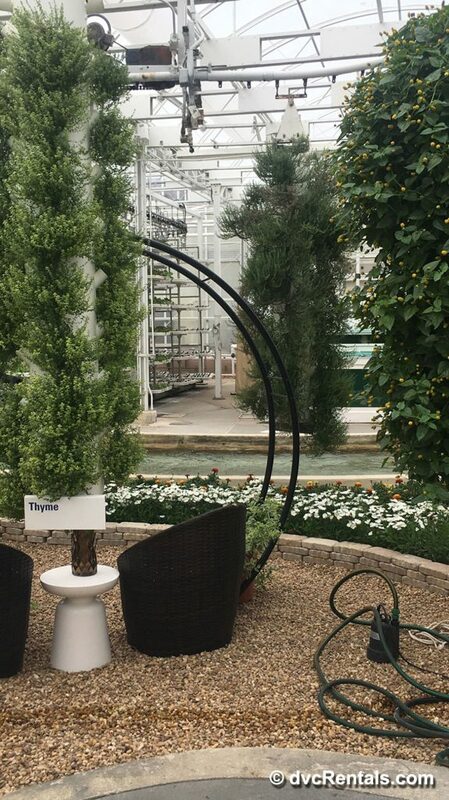 It is truly amazing to see how many plants they keep within their greenhouses and how many staff are hired to take care of our nature! It’s certainly fitting, we had traveled during the “Epcot International Flower and Garden Festival” and being surrounded by all of the flowers and nature really keeps you interested in learning more about the behind the scenes. 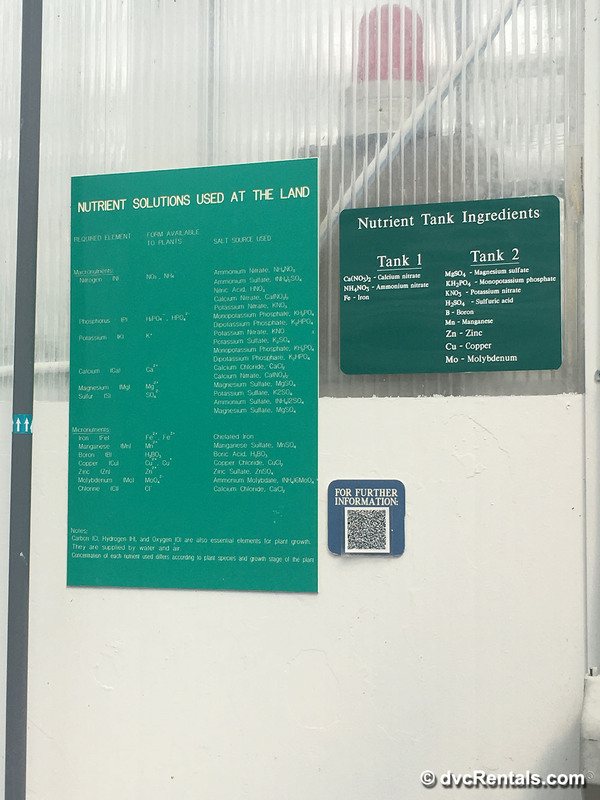 Our tour guide Brian was super informative, he allowed us to take photos of absolutely everything we wanted, including the “Nutrients Solutions Used at the Land” how neat is this! Now for those of you who are not super fluent in sciences, you are not alone, nor am I. Not to worry, they do a phenomenal job at explaining the ins and outs in terms that everyone is able to understand, keeping it interesting along the way. Brian had shown us a really neat plant that even had a name, “Stanley”. Fun fact: As part of a defense mechanism, if a bug were to fly into the leaves, they fold up to scare away the predator. We had permission to touch the leaves of the plant to observe the reaction and what an amazing thing to see! 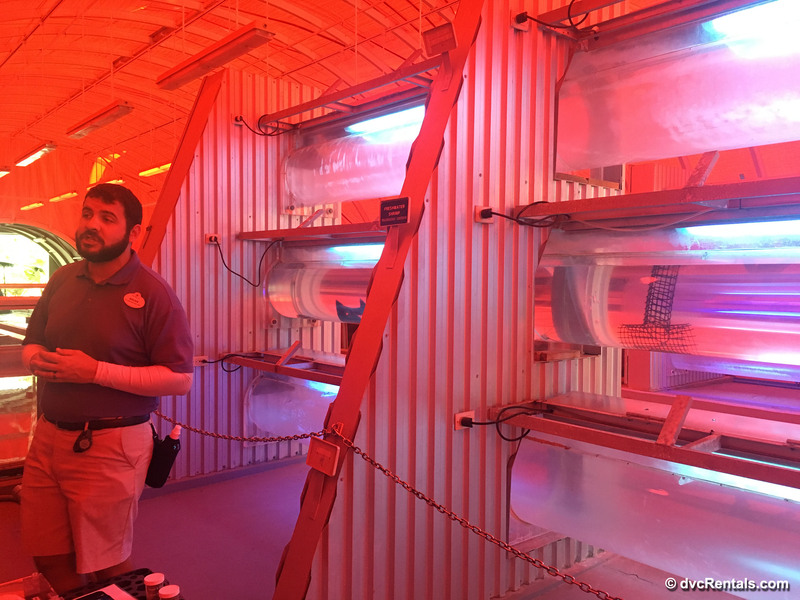 A term that was used throughout the tour was “Hydroponics” and what this means is that many of their plants do not grow in soil, they are soil free. Now how could a plant possibly grow without soil? That’s what I was thinking. Brian explained to us that the plants actually grow while hanging in the air using mineral nutrients within the water that is sprayed. Super neat isn’t it! When following along on the tour, don’t forget to look down. 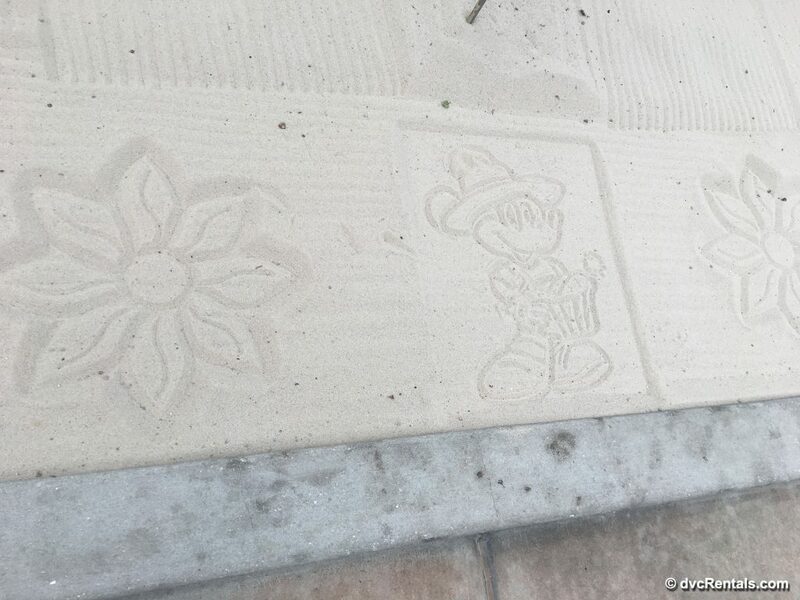 Of course, it wouldn’t be fully Disney without the extra touches, look in the sand! Going into the tour, I also didn’t take into consideration that we would not only be learning about plants, but also insects and fish. Brain had shown us the fish farm where we were each able to toss a handful of food to the fish and learn more about eco-farming. 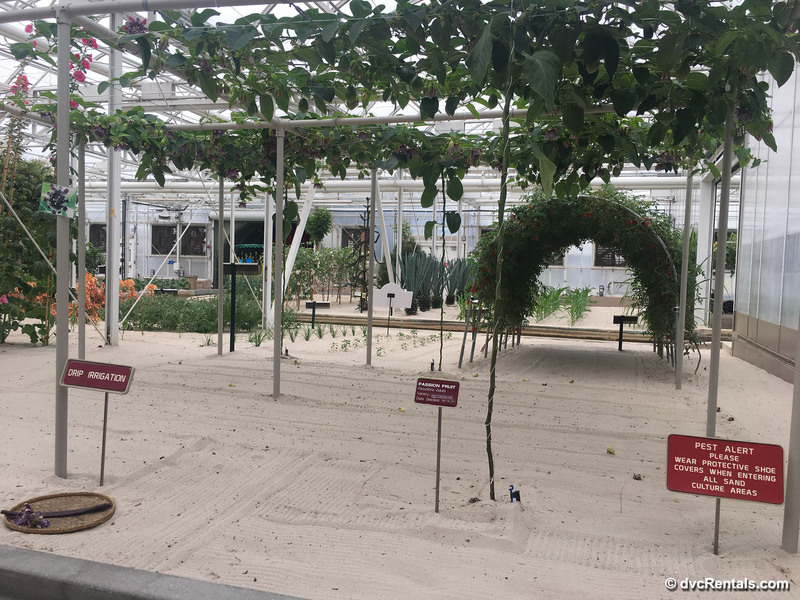 We also were able to see all the amazing fruit/vegetables that are grown right within their greenhouses. Not to mention, we made a pit stop to sample some cucumbers, wow they were tasty! As you can see, there is so much to view on this tour and the fun facts you absorb along the way. I can definitely say that my science abilities are now up to par! 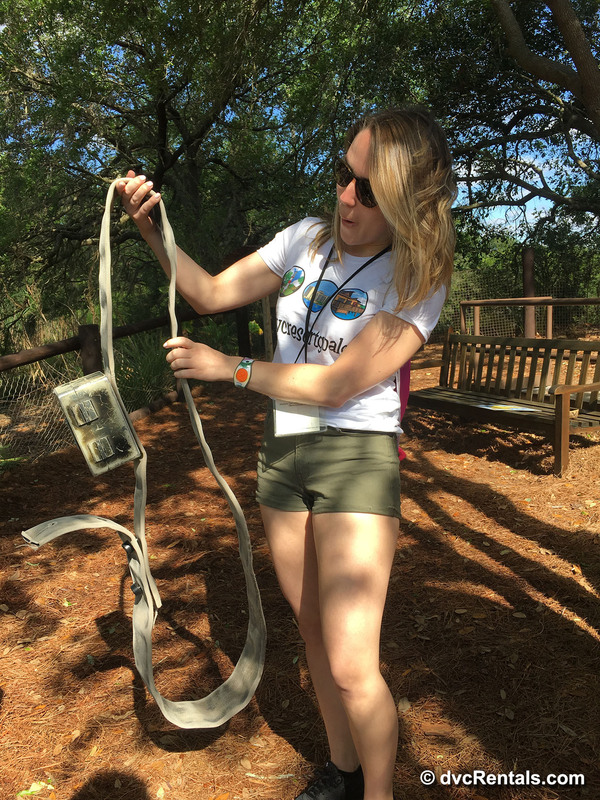 I highly encourage you to try this tour and learn about all things nature. Ask as many questions as you need to, the tour guides are highly informative and are ready to teach. 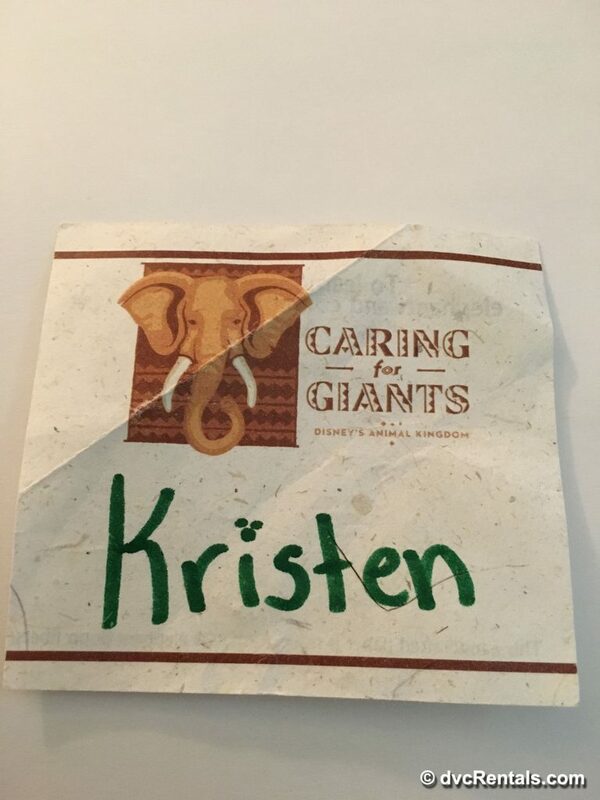 Day 4 had arrived, and we were off to our next tour called “Caring for Giants”. I am sure many of you may have heard of this, however, if you are a new comer and want more insight, I am here to help! 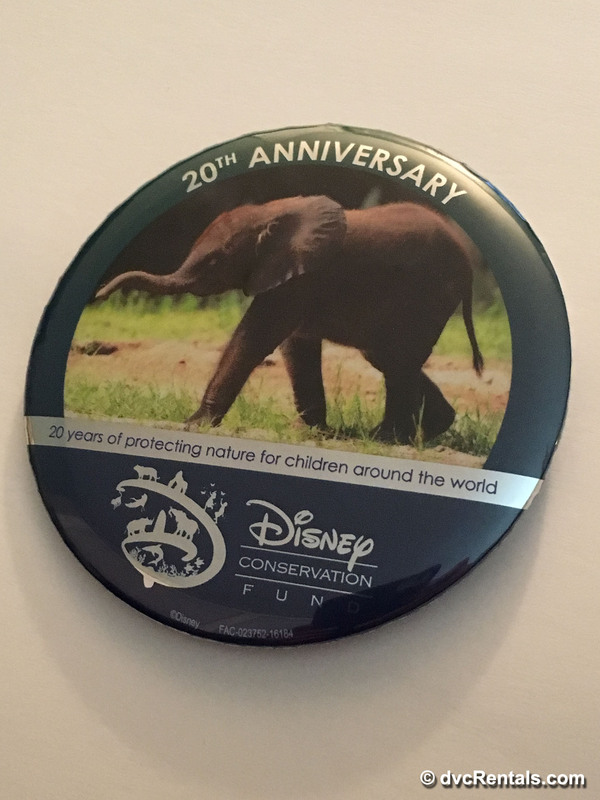 If you are a big fan of elephants, this is the most perfect place for you. 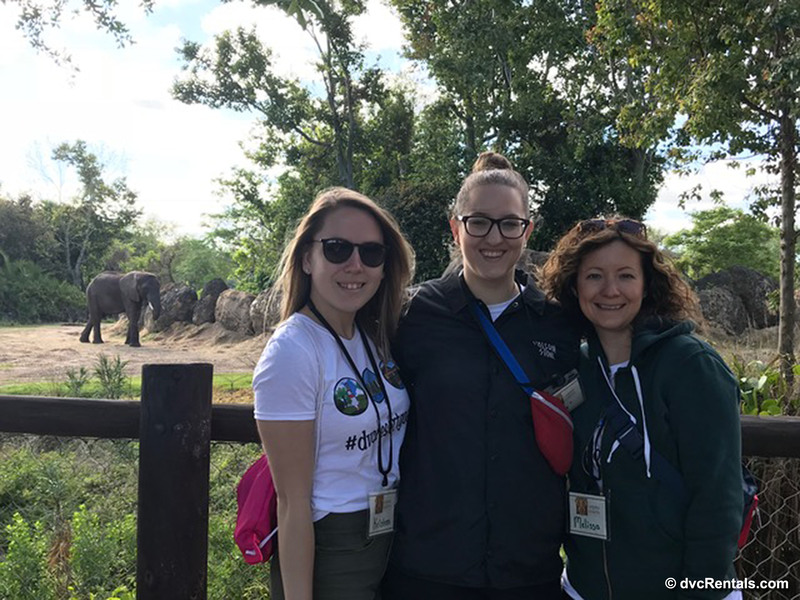 During this tour, we were taken into the world of the habitats of elephants, their history as well as their caretaker’s responsibilities. From the moment we went “behind the scenes” with our name badges on, I felt the VIP treatment! What’s nice about the tour we went on, was there was only 8 of us, therefore, we had more of a one on one learning session with the cast members. 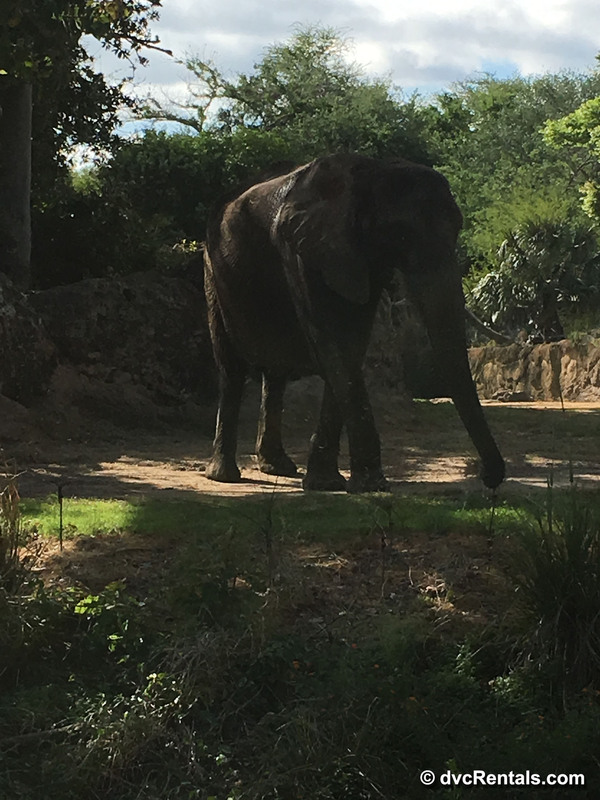 Every step of the tour is magical, I don’t want to spoil too much of the surprises and special touches, but I will tell you that when you arrive at the viewing, you feel like you are in Africa with the loving giants only 80-100 feet away. I could not stop taking photo after photo! 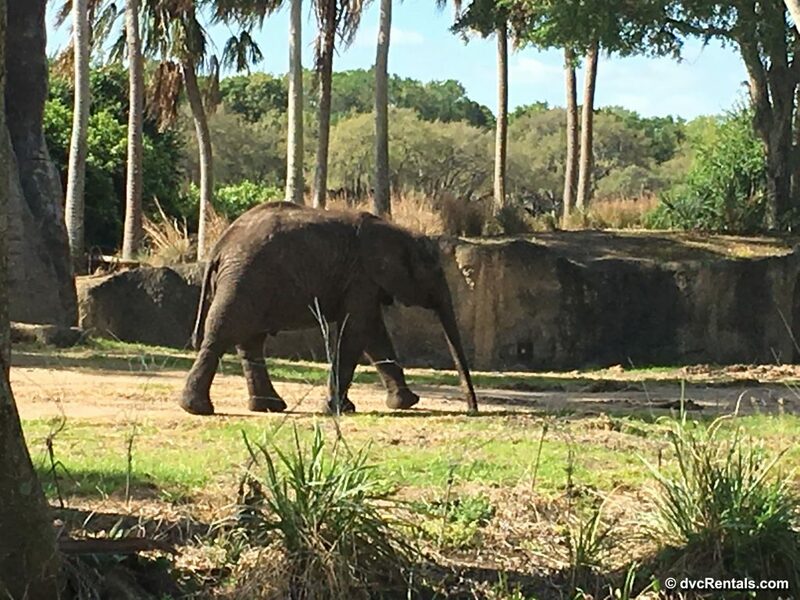 As you are continuing to take about 100+ photos of the best views you could possibly see, the cast members do a fabulous job with informing you on what their day to day responsibilities are and also the facts on elephants. Fun fact: Did you know that an elephant’s feces are used to create paper and can make up to a full notebook, how interesting is that? This may not be an appealing topic for everyone, but I sure thought it was a cool fact to know about. Take a look at this sample that we had been shown by one of our wonderful tour guide caretakers! Don’t worry, it has been put together to showcase for guests. Chris was also another caretaker of the giants, and he has only been working at Disney for about 4 months, traveling all the way from Africa! 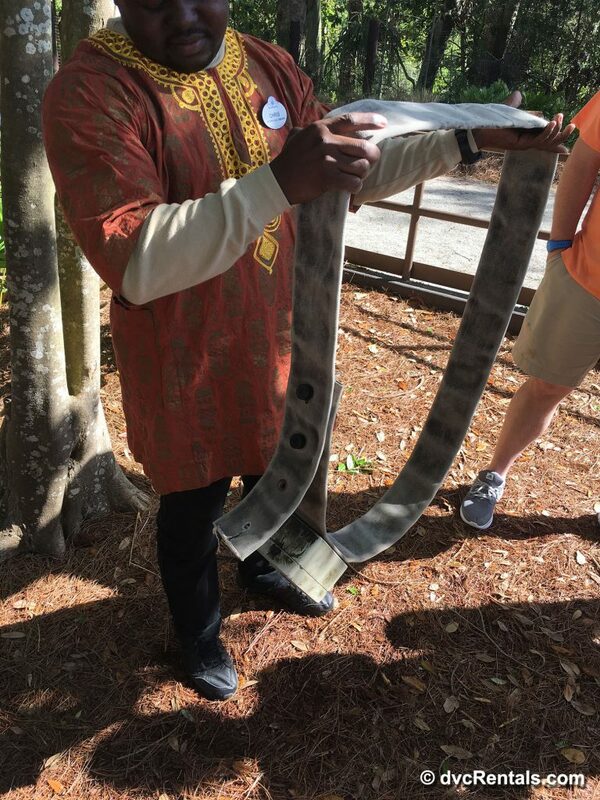 He had really gone into detail with the African culture and how elephants have an amazing history. When speaking about the collars that are used for tracking, we were able to see one up close, and of course, I had to see how heavy and large it was. As you can see, I am quite in shock with the size! From start to finish, this is my favorite so far. 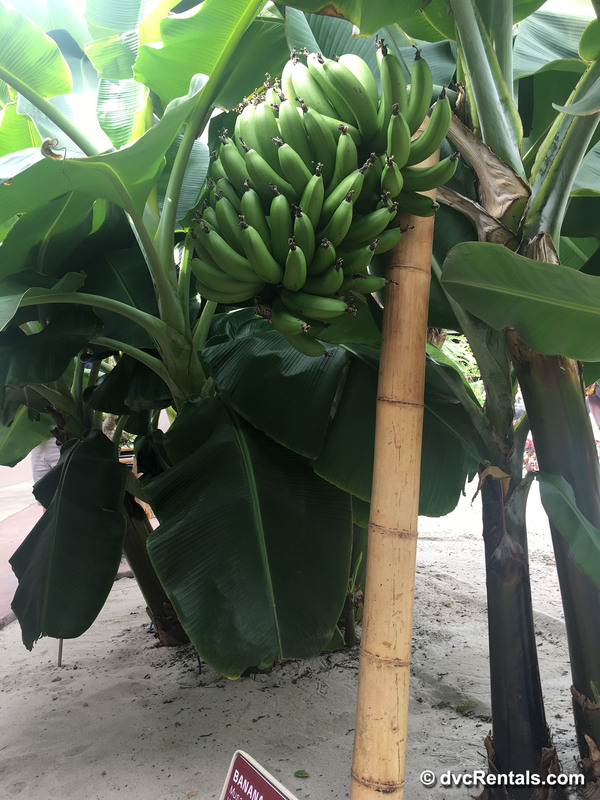 It was all the small details that made the tour so memorable, whether it was the informative cast members, the fun facts along the way and of course the giants! 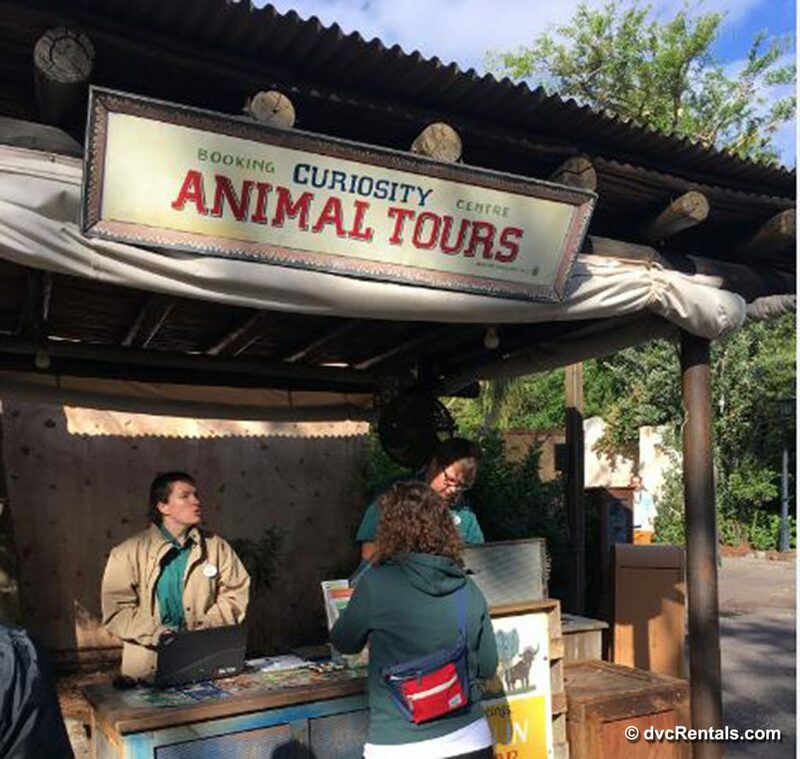 If you are ever in Disney’s Animal Kingdom Theme Park, be sure to stop by the tour guide booth to see what a good fit for your family may be. 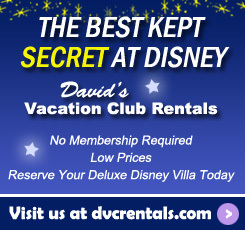 If you are a planner like me, you can also book before you travel by calling 407 WDW-Tour. All in all, this is now one of my favorite things to do when I travel to Disney. There is something very memorable about taking a small group tour, gaining knowledge and taking some awesome photos! 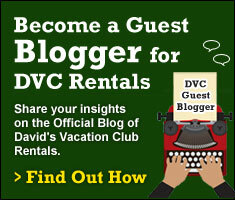 I wonder what will be next for me, maybe Disney’s Keys to the Kingdom Tour? I hope you all give at least one a try and share your experiences!